Walking up to Honda’s all-new CR-V for the first time, I had to do a double-take. Was this the wrong car? Did Honda accidentally bring me a Pilot? Because the vehicle in my driveway looked too big, substantial and tough to be the cute little CR-V I was expecting. After a quick walk around, though, I realized it was the right car — just a lot different from the old CR-V stored away in my memory bank. This new 2017 version is wider, taller and longer, and when combined with a fresh look that gives it a more truck-like stance, the difference is dramatic. 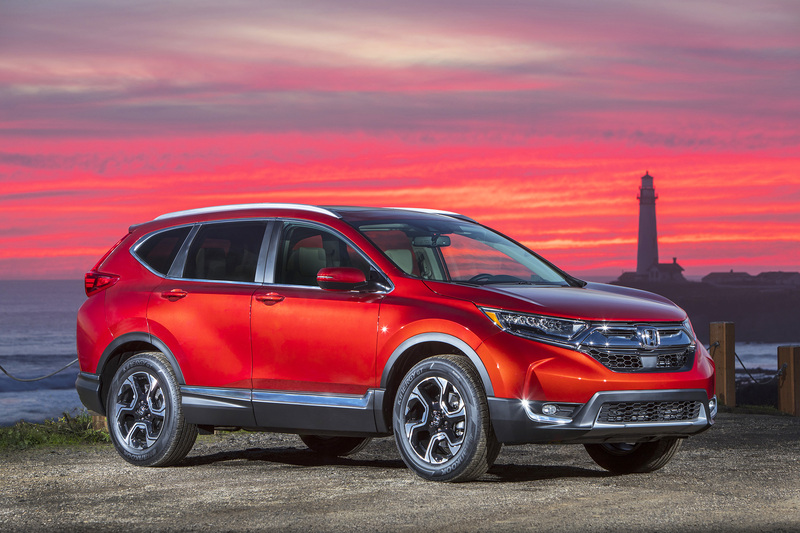 For people already familiar with the CR-V — a huge crowd, considering Honda has sold nearly 4 million of these in America since 1997 — many things about the newly designed version will seem instantly familiar. It still has a firm and responsive feel from the driver’s seat, a well-constructed cabin packed with smartly designed storage spaces, and efficient interior packaging that makes it seem even roomier on the inside than it looks from the outside. But there are a lot of differences, too, including something Honda has never offered before now on the CR-V: a choice of engines. A new-generation CR-V bows for 2017, making the popular Honda crossover vehicle bigger, more powerful and more efficient than before. It’s an all-around upgrade over the outgoing model. You can still get a naturally aspirated, 2.4-liter, four-cylinder engine if you want. For better power and fuel economy, though, Honda offers a 1.5-liter turbocharged engine on EX, EX-L and Touring trims. The turbo engine in my tester felt like a good fit. The CR-V has never been a particularly fast car, but this engine is more than adequate on highway on-ramps thanks to its 190-horsepower output. Unfortunately, it sends all its power through a continuously variable transmission (CVT), that newfangled way of “shifting” that makes the driving experience less visceral. Most drivers won’t care, but a few of us are mourning the loss of that crisp, thrilling burst of power that happens when you step on the gas and feel the gears snap to attention like cadets at West Point. CVTs feel like an old man slowly climbing out of bed in comparison. On the bright side, Honda says this transmission is quieter, has better acceleration and a smoother feel at startup than other designs. It also offers the best fuel economy in its class, a whopping 34 mpg on the highway and 28 in the city for two-wheel-drive models. My all-wheel-drive tester is rated for just 1 mpg worse than that, too, a remarkably tiny penalty for the extra traction. The added space is very evident in the new CR-V’s cabin. It has a thoughtfully designed layout for the driver, the back-seat passengers and the flexible cargo area in back. — An electric power steering system with variable gear ratios, making it feel better at high speeds and be more maneuverable in parking lots. — Agile Handling Assist, which controls the brakes to help the vehicle feel more smooth and predictable when swerving, changing lanes or driving on winding roads. — A more silent cabin thanks to extra insulation to eliminate road noise, a quieter engine, active noise control and less wind noise from the body. — A pair of 2.5-amp USB charging ports in the back seat to keep your passengers’ iPads juiced up. — Four-way lumbar support adjustment to make the front seats more comfortable on high-end trims. — Road departure mitigation and adaptive cruise control, two features not available on the CR-V before now. — A system that monitors the driver’s attention level and alerts you if you start to get sleepy or distracted, something I’ve only seen on fancy Mercedes-Benz cars before now. Pricing starts at $24,045 for the base model and ranges up to $33,695 for the Touring trim with all-wheel drive. The popular CR-V gets a thorough upgrade for a new generation in 2017. It’s roomier, more efficient and more refined now.